Options for West Virginia Tax Reform Study provides insight into how changes to the West Virginia tax code can affect the state's economy overall. 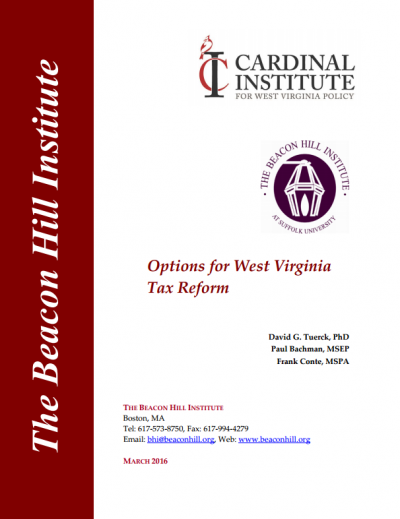 The Cardinal Institute and the Beacon Hill Institute at Suffolk University have released their joint study on West Virginia Tax Reform. The study utilizes Beacon Hill’s proprietary State Tax Analysis Modeling Program (aka, “STAMP”) and examines several components of the tax code including sales tax, corporate income tax, severance tax, business property taxes and personal property taxes as well as cigarette taxes, residential property taxes and various income tax rates.